Hopefully you will have noticed the Competition Fund totaliser has changed, we are now at £42.79 having made £16.73 in the last 28 days! So that's great news, your efforts are certainly making the difference. Actually lets just take a minute to point out that's £16.27 in one month, something that previously has taken over one year! I'm not going to do a break down of which country did what because I'll be looking a little more into traffic and how that may have influenced the balance. It does however suggest that as we're less than a quarter of the way to completing my target the competition will have to begin in earnest. Should I have another bumper month we could well have reached the £60 mark by my birthday which means entries for the competition really need to start coming in. So, as things are advancing quicker than expected I'm going to formalise a couple of things. I will keep checking the balance but given it could reach target at the end of February or more likely March I am going to provisionally state that competition judging will begin at the end of March and take place over April with the final decision being made then. If funds are not sufficient I will adjust the dates. Equally if the deadline for submissions seems too tight please let me know and I'll push things back. But with things progressing so fast I wanted to start seeing entries and set some end point for folk to work toward. I'll take stock again midway through Feb and then promote this wider, which may well increase the click through [£3.78 got added to the fund on the 7th Jan, the day of my last update so that's definitely a catalyst]. Whatever extra is made I will put towards a second place prize which will be a £10 voucher for the hobby shop of your choice, I thought just a winners prize was a little unfair so maybe that sounds like a nice idea. Now, tips for bloggers, hopefully this doesn't come across as egotistical, I know there's a lot of readers with their own blogs and these observations might be of use. This last month you can see from my stats below I broke my record for page views, finally smashing through the 30,000 page views in one month, sadly it then reconfigures the graph so it looks less impressive but it is cool to see 40,000 up there permanently though. 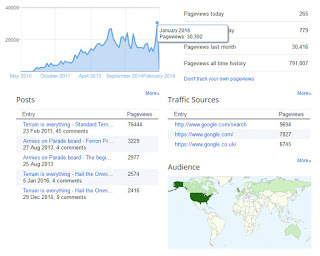 However, you can see that there was a period prior to that where my page views weren't comparable with January or even my most popular period back when I was making my Skyshield and pimping the blog as much as possible on forums and social media. So my average fluctuates quite wildly and therefore you're probably interested to know what changed. Having a unique feature in your blog is always good and if it's something like a freebie or a really solid tutorial then they can gain traction on their own. 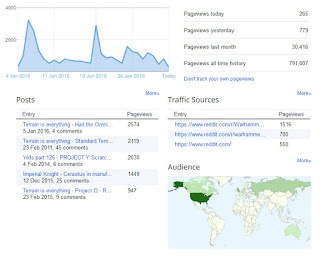 But the main driver for these figures was a random decision to engage with reddit you can see over 3000+ hits came from there in the last month. If I'm honest I still don't know what it is or how it works, they suggest you should operate a 1 in 10 posting formula where you post 1 item of your own for every 10 posts you debate other people but that doesn't seem the case, everyone's - 'look at my stuff'. Again I don't see it as a be all and end all, the traffic dissipates pretty quickly and I've only added a few extra followers since then so it's not going to continue at that level either. As an exercise in supporting the blog it was definitely worth doing. I was initially amazed at that first days stats then immediately realised how ridiculous chasing numbers was until midway through the month when I though you know I could break my record here, so I did but I'm over it now. As a test I even used reddit to promote Liam's blog and he went from a 100 hits to 809 in one day and he hasn't posted in 3 months! So, if you're chasing numbers it may be worth giving it a go, whether it translates to regular followers or moves you up a level is debatable but I'd advise using it sparingly as I could see myself spamming it otherwise. Far better to grow your blog organically than constantly force-feeding it. Hope there are some interesting observations in there for you. Well you've seen my entry already! I've been adding clicks whenever I visit your site too, so hopefully things will progress nice and quickly! Thanks Nick, I love burrowing into the data to see what's going on. I may not understand all of it but it's been quite interesting as there's a measurable difference over the past few months and that's been much more revealing than the five years that did very little. I'm definitely going to do this sort of thing again, although maybe not straight away as I want to compare the clicks for competition versus clicks for 'profit' and see the difference between before and after. I've got to agree with you there, I have the occasional look at the stats and barely have any clue what they mean! I do know that I managed more in the last month than any month previously though, so maybe it's a January thing? 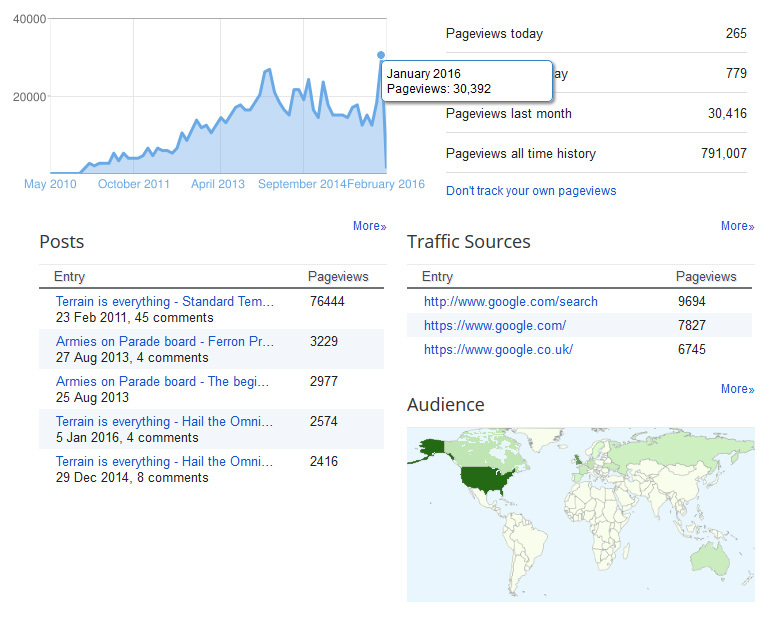 For me it coincided with a big upturn in views on the blog from eastern Europe (mainly Russia). I've been making an effort to click on the ads whenever I visit the site, every little helps. I've often thought about putting ads on my blog, but haven't yet. Some blogs have ads all over the place and it can get annoying (yours are quite unobtrusive though). Thanks for the tip on Reddit. Never considered it before, but tried posting an article about an hour ago and I've already got about 150 links from it (about the same number as google from the last week!). Nick- Funnily enough, January has seen a huge boost in traffic for me too, despite not posting as often as I normally do. Maybe people just want to read more for resolutions in the new year. Glad I could help and thanks for all the clicking too. I advocate the use of ads, it's no real hardship for your viewers, no one has to click them but more importantly even if they do they're not having to put their hands in their pockets to support you. I'm not sure I can bring myself to do anything else. The oroginal AdSense funds got me a Knight which was really nice, took a really long time but to try and monetise in a different way like a PayPal donate button or Patreon - as much as that would be cool to make a bit of income it feels like I'm asking your mates for money. Which implies you're lal my mates, which makes me sound sad. I dunno, I'm just not there yet. I can definitely imagine there is a way to do it that I would feel comfortable with but I'd need to take the blog from 'amateur' to 'professional' to do that and that would take up even more of my time! How do you post things to reddit that link to your blog? Honestly I have no idea of how it works. There is a picture, then underneath it a search function for the sub-reddit and then 'submit a new link' and then a 'submit a new text post'. The link is the one you want and it'll source a preview image and you can even get it to suggest a title too. It's really easy, but deceptively hard too, I'm finding it really weird but it certainly helped in this instance. Hmm it just does not seem to be picking a picture up for it. There is an option to 'refresh' the image. Alternatively it might be the imagetype and if it's embedded or linked in your blog, I know sometimes certain types don't get reshared in blog rolls I'm a part of, but that's just a guess. Hi! I've also started to support other bloggers with clicks:) What's more you've persuaded me to add one for mine as well (I've been struggling with decision for some time).